Please contact us for more information on accommodation as well as information on local attractions on the form below. We will reply as soon as we see your message. We are situated on the western side of Christchurch. Leave Christchurch on Highway 73 (Yaldhurst Road). At the roundabout drive straight on for 2km ( West Coast Road)then turn right onto the Old West Coast Road (also signposted Waddington) . 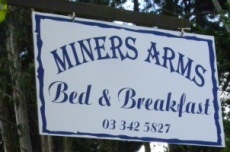 Miners Arms is 4.5 km along on your left.